A NEW viscosity test protocol from Rheosense demonstrates how it is possible to obtain accurate test measurements on samples as small as 20ul. The company says this is the the lowest sample volume requirement available, and is achieveable with its m-Vroc viscometer. The test protocol explains that 50ul samples are usually recommended, but in cases where sample volumes are extremely limited the lower 20ul volume can be used. Key to the use of this tiny volume is thorough preparation and cleaning, together with careful loading of the sample in the Vroc test cell. 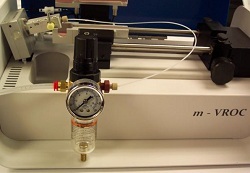 Several additional steps are required over the standard viscosity measurement procedure. Rheosense says that its customers drove the development of this development. “We heard a common need to reduce sample size, especially in protein formulation, because the fluids were so expensive” said Matt Chamberlain, product marketing director. “By providing a protocol which uses only twenty microlitres of sample, m-Vroc can save tens to hundreds of thousands of dollars per year compared to similar viscometers”. The test protocol can be downloaded from Rheosense’s website.